Recent events in Cyprus have seen an uptick in volatility and downward selling pressure in the euro as traders and investors digest the full impact of the government decision to force losses onto bank deposits. Most Forex traders typically favor counter trend trading methods: buying into weakness, selling into strength. For much of the time this trading strategy works very well, however surprise events such as the Cyprus bank levy announcement last week can cause unexpected spikes in volatility and large losses for those ‘mean reversion’ traders. At Forex Trading-Pips we protect against and profit from expansions in volatility using robust volatility breakout strategies which capitalize on the losses incurred by other traders caught wrong footed. 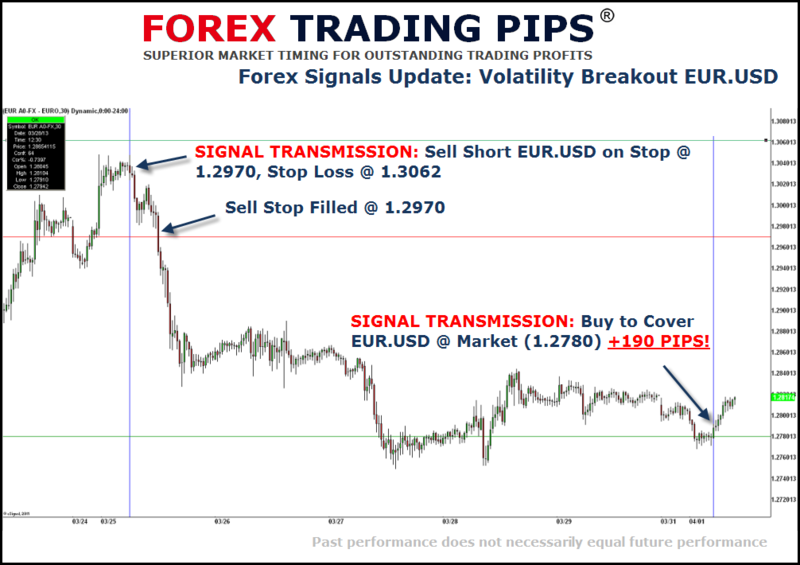 This morning we closed +190 PIPS profit on EUR.USD in our Forex Signals Weekly Volatility Breakout trades initiated last Monday following the Cyprus bank levy announcement. Forex Signals trade entry and exit are marked on the EUR.USD chart below: all signals transmitted live to our Forex Signals clients in real time and are not hypothetical. Note how EUR/USD opens and closes at opposite extremes for the week: prices ‘open’ on Monday at their highs and ‘close’ on Friday very close to their lows for the week. This phenomenon of price opening and closing at opposite extremes for the week – typically within the most extreme 15%-20% of the weeks range – is very common on big range moves and is the reason why volatility breakout methods can be so incredibly effective. The best performing volatility breakout trades will normally show very high early momentum coming off the ‘open’ as traders rush to fill their orders. Note on the euro chart above how rapidly prices drop off as early trading gets underway in London Monday morning setting up a decent profit opportunity for traders who understand how to capitalize on the move. If you would like to learn more about Forex Trading Secrets that can help you succeed in the Forex markets, get started today on a risk free trial of our Proven Forex Signals Program.